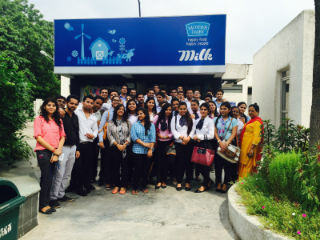 PGDM students of 1st year went for an industrial trip to the Mother Dairy head quarters at Patparganj, Delhi. Mother Dairy, set up in 1974 is known for its hygiene and good quality of milk and agro products. Students were briefed about the milk ingredients and various benefits of milk. They were also explained about the working of the Mother Dairy through a presentation which was very informative and interesting. Later, all the visitors were given refreshments in the form of flavored Milk and Ice Creams.